Price: £1.40 (incl VAT) Sorry, this item is currently unavailable. Click here to receive notification when this product comes back into stock. 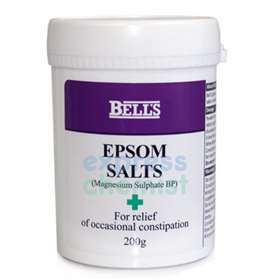 Bell's Epsom Salts (Magnesium Sulphate BP) - For relief of occasional constipation. Epsom salts work like a laxative to relieve constipation. The magnesium sulphate increases water in the intestines to provide temporary relief from constipation. Directions for Use: Powder for oral use. Adults and children over 12 years: Take 1g to 4g dissolved in a glass of warm water, once daily. A level 5ml teaspoon holds about 5g. When dissolved in water use within 24 hours. Consult your doctor if the symptoms persist for more than 5 days. Warnings: DO NOT USE IN CASES OF INTESTINAL BLOCKAGE. CONSULT YOUR DOCTOR IF YOU ARE TAKING TETRACYCLINES, GIGOXIN, VITAMINS OR IRON SUPPLEMENTS. DO NOT USE IF YOU ARE PREGNANT OR BREAT-FEEDING UNLESS ON THE ADVICE OF YOUR DOCTOR. CONSULT YOUR DOCTOR OR PHARMACIST BEFORE USE IF YOU HAVE A KIDNEY PROBLEM OR YOU HAVE BEEN ILL OR YOU ARE ELDERLY. Product code: 1074855 Price: £1.40 (incl VAT) Sorry, this item is currently unavailable. Click here to receive notification when this product comes back into stock.